This Austin Resident Was On Texas' List Of Potential Illegal Voters. Now She's Suing. Julieta Garibay was on a list of people the Secretary of State said might have voted illegally. She and six other U.S. citizens are suing state officials, arguing the state is violating their voting rights. Julieta Garibay is one of almost 100,000 people on Texas' voter rolls who state officials recently said might not be citizens. Like many people on the list, though, the Austin resident recently became a U.S. citizen and has the right to vote. Garibay, along with six other voters and voting rights groups, sued state officials over the weekend, claiming Texas’ effort to identify and remove alleged noncitizens from voter rolls was intended to single out and intimidate citizens who were not born in the United States. On Jan. 25, Texas Secretary of State David Whitley announced his office wanted local election officials to look into removing people from the voters rolls whom his office suspected were not U.S. citizens. His office compiled a list of people who had registered for a driver’s license or state ID as a noncitizen in the past 22 years, but who had also registered to vote in that period. The list included roughly 95,000 names. On Twitter, Texas Attorney General Ken Paxton and President Donald Trump both said the list was evidence of voter fraud – evidence that noncitizens were voting in Texas elections. Voting rights groups argued the state’s list was likely of people who ­– like Garibay – became citizens shortly after they registered with the state as noncitizens. Garibay had been undocumented for many years. A couple years ago, she applied for legal status through a special program under the Violence Against Women Act. It helps survivors of domestic violence like her report abuse to police without fear of deportation. In April, Garibay says, she became a citizen. Two days later, she was running the Capitol 10K. “I got to the end and there was like a big booth and they were like, ‘Register to vote,’" she says, "and we were like, ‘Oh my god, we need to register to vote." 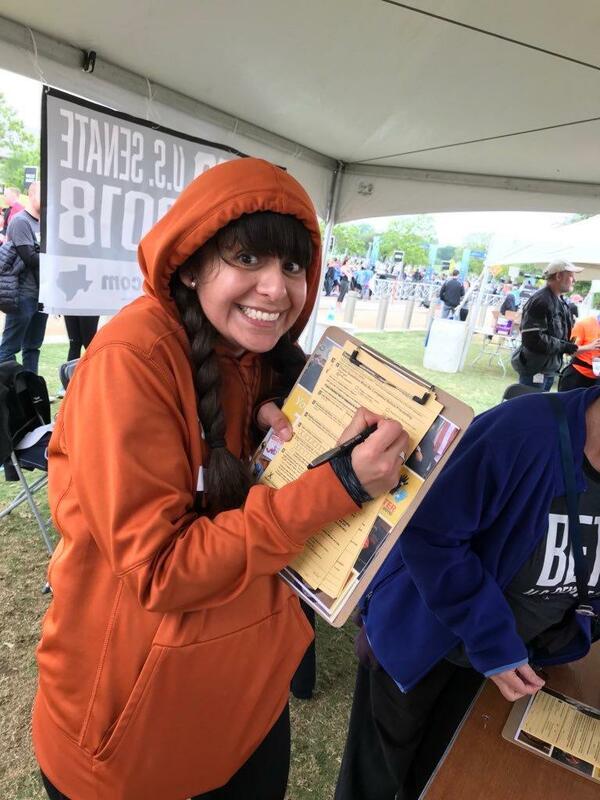 Garibay registers to vote at a both near the finish line of the Capitol 10K last year. Just a few months before that, in September 2017, Garibay renewed her driver’s license. She was a legal permanent resident at the time, which is something she had to report to Texas when she applied for a renewal. She wasn’t required to update the state if her status changed. So, when she saw news of the state’s voter purge list on Twitter, Garibay says, she became concerned. “I kept on reading and I was like, ‘I am likely one of them,’” she says. Garibay says she sent an email to the Travis County voter registrar’s office last week and asked if she was on the list. Soon after, she got a call. "The person said ... ‘I am calling you because you emailed us and I wanted to let you know you are on the list,’” Garibay says. The office didn't provide any other information, Garibay says, which was really frustrating. Travis County’s voter registrar, Bruce Elfant, has said his office is investigating and checking the state’s list. Last week, he said he had been removing a lot of names, which has been time-consuming and tedious. “It would have been nice if they would have vetted this more carefully before they sent it out to election administrators,” he said at the time. Elfant also said he’s not sending letters to people on the list asking them to prove their citizenship until he is sure he’s taken people off who are citizens. While there’s a lot of frustration about how messy the process has been, Gov. Greg Abbott defended the effort. He said last week Whitley intended for it to be a team effort. Garibay says this is more than just a couple of mistakes. In particular, Garibay says she is offended by how haphazardly state officials seemed to carry out this voter purge. She says voting isn’t a causal matter. Garibay says she feels this is part of a larger attack on immigrants in Texas. But she's not surprised. The lawsuit, filed in federal court in Corpus Christi, names Whitley, Paxton, Abbott and others as defendants in the case. They are also asking the court to stop the voter purge immediately. Voting rights groups and local election officials say the state’s bungled effort to prove there are thousands of noncitizens on the state’s voter rolls is all about making voter registration harder in Texas before the 2020 election.